Members present represented a broad cross-section of HCS vintages, starting with at least three who were in school during World War II, then a mixture from all decades across the remainder of the Twentieth Century and into the Noughties. Peter Fairman-Bourn acted as Chairman for the night and therefore thanked everyone for coming to this the first dinner that OHiL will have staged. 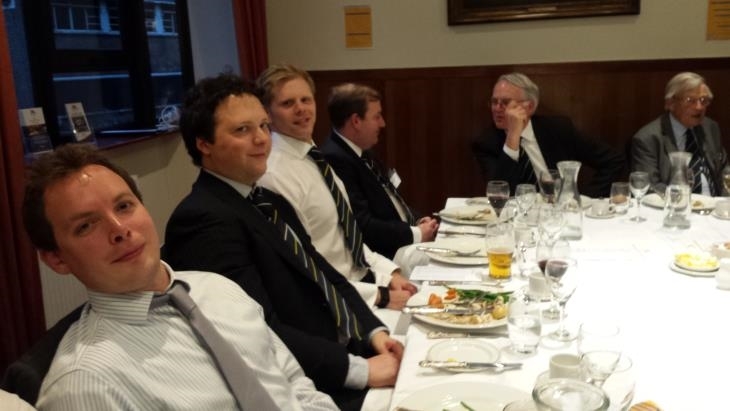 He explained however that reunion dinners have been held in the Capital ever since 1910 and had latterly been organised by the OH Club itself. Unfortunately the function planned for April 2016 sadly had to be cancelled because of low numbers so the OHC Committee elected NOT to hold a dinner in 2017. OHiL therefore agreed to ‘take up the challenge’ and run this particular one as a ‘pilot‘. Peter Davies (OH 1943 – 1946) kindly agreed to offer the toast to Her Majesty the Queen instead. He reminded us that she had just reached her 91st birthday a week before and that he was just 4 years younger than her! Indeed this year represents her Sapphire Jubilee, being 65 years since her accession to the Throne in February 1952. Peter D. was followed by Michael P. Moreton (OH) who proposed a toast to The School. Michael is a veteran campanologist and, having been a dedicated supporter of all OH matters for well over fifty years, it seemed appropriate that he should invite us all to raise our glasses to his old school. Dr. Tomlinson responded, then gave way to Mrs Morgan-Jones who read out some interesting school notes prepared for her by Headmaster Paul Smith in his absence. While guests were still finishing their coffee with mints, the Chairman opened up the floor to whomsoever wished to say a few words. One particular speaker began by asking the question….” Who here became Head of School?“….and at least 4 or 5 members raised their hands!